We spent over 50 hours researching and testing 14 different kinds of hiking watches and found that extra features, durability, and style were most important. The Casio Men’s Pathfinder Sport Watch scored high marks in every category and is our top pick. If you love being outdoors, you will love this watch. It provides everything you need to keep up to date on weather, navigate trails and other outdoor factors including elevation, ascent and descent speeds and much more. It has a convenient alarm, a countdown timer and sunrise/sunset times for over 400 locations around the world. The backlight option allows for easy viewing even in low light conditions. A hiking watch has different features that enable the wearer to keep track of many different things from altitude to the weather. Outdoor enthusiasts love keeping track of many different pieces of information from heart rate to barometric pressure to altitude. There is a large selection of hiking watches on the market to choose from. Other names that hiking watches go by include sport watches and training watches. The features that a hiking watch offers are all very beneficial to the outdoor enthusiast. If you spend a lot of time outdoors doing various things, you will really enjoy having a watch that will support your outdoor activities and help you keep track of the things you do a long with outdoor specific functions such as a digital compass, altimeter and other valuable processes. 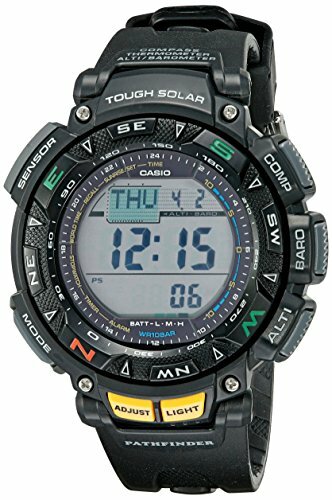 Casio is a well known name in high quality watches as this hiking watch demonstrates. There are a lot of available features that the Casio Pathfinder Triple Sensor Sport Watch offers its wearers. Other popular features include offering world time in 31 different time zones and 48 major cities, a city code display, five different alarms that can be used to help you remember those important meetings, a full automatic calendar that is pre-programmed all the way until 2099. This watch has Quartz movement with a digital display and 51mm stainless steel case with a mineral dial window that is scratch resistant. The battery power indicator prevents you from getting caught with an uncharged watch. There is also a useful function that saves battery power that prevents the battery from draining too fast. It is water resistant to 100m (330 feet) and is suitable for swimming and boating. The resin band with buckle enclosure is durable and long lasting and easy to operate. The approximate battery life of the Casio Pathfinder is 6 months when fully charged, even if there is no more exposure to light. The backlight feature has afterglow and is perfect for anyone who is out at night. It provides plenty of light to see the watch information clearly and easily. The solar powered watch is a really high tech power house and any hiker or outdoor enthusiast will love all it is capable of. There are many features that this watch possesses that make it an excellent choice for hikers, backpackers, campers and others that spend a lot of time outdoors. Features of this watch include a countdown timer, full automatic EL backlight that has afterglow for seeing well in all types of light. 5 different daily alarms, an hourly chime signal, power saving function, an auto calendar that is preprogrammed all the way up to the year 2099. 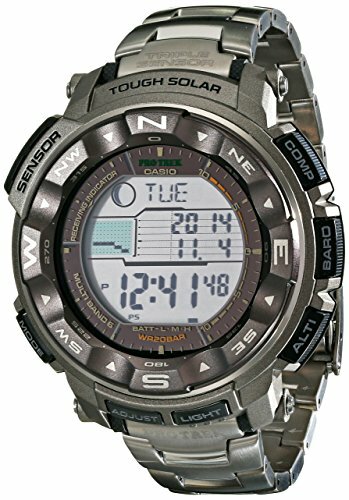 This Casio Hiking Pro Trek Watch is water resistant up to 200 meters and has a tide graph too. In addition, there are LCD layouts that provide built in There are so many things to love about this watch that you won’t be able to count them all. This attractive titanium band watch has a black face and is in digital format. 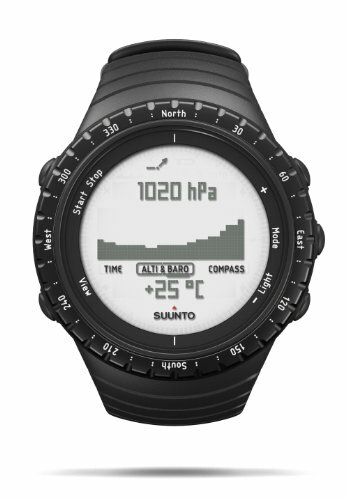 Whether you love hiking, biking, or camping, the Suunto Core Wrist-Top Computer Watch will provide you with all that you need to navigate trails and keep up to date on the weather and other outdoor factors. This watch has an altimeter, barometer, compass and a depth meter as well. The altimeter will keep you apprised of elevation, shows your ascent or descent speed and records your progress. Different watch features include the ability to keep track of the time and date, an alarm, a convenient sports chronograph and a useful countdown timer. You can also keep track of the sunset and sunrise time for 400 different locations around the world. You will never be caught unaware in a storm as long as you have this watch on. It will warn you of an impending storm even if it looks like there isn’t a cloud in the sky. Once it senses the change, an alert will sound letting you know change is coming. The Intelligent Storm Alarm is one of many intelligent features that are designed to keep you safe during your outdoor adventures. This watch is water resistant to 100 feet and can handle snorkeling up to 30 feet. It can function in several languages including Spanish, English, French and German. It is available in a variety of color choices that will appeal to many different tastes. With all of the features that this hiking watch offers, you will be well equipped with all you need to enjoy the outdoors and stay informed on weather and other important pieces of information while you are enjoying the great outdoors. The low battery warning prevents your watch from dying unexpectedly and the backlight option allows wearers to see the time and other information even in low light conditions. Outdoor enthusiasts usually participate in a number of activities from swimming to cycling to hiking. All three of the watches featured above were chosen after extensive research. We compared the top selling hiking watches on the market, comparing them on performance, features, style and longevity as well as other factors. If you’re not sure about the right hiking watch for you, read our buyer’s guide below and learn what you need to look for when you are searching for the perfect watch for your outdoor pursuits. Having all the information you need to make an informed decision will give you the confidence you need to choose a watch that you will love wearing on your outdoor adventures. What is a Hiking Watch? A hiking watch is a watch that has a lot of features that can be used while you are outdoors doing various activities. A more common name for these types of watches is sport watch or even outdoor watch. The features that a sport watch offers are all very beneficial to the outdoor enthusiast. We will go over the different things you should look for when purchasing a hiking watch. This buyer’s guide will help you learn how to choose a watch that you are going to love wearing and using. Display – The display of your watch is very important. The display is what shows you all of the information that you want to see including the time, date, temperature and many other things that a hiking watch shows. You want to look at such things as the size of the watch face, the size of the numbers on the dial, night illumination capability, contrast and whether it is digital or analog. Digital tends to be faster and easier to read. Time Features – Most watches nowadays, especially hiking or outdoor watches do not just display the time. There are many other time related features that it can display including dates, calendars, time zones, countdown timers, stopwatches, and more. Size – The size of the watch can be a factor for some outdoor enthusiasts depending on the activities they are participating in. If you are a hiker or runner, you may want a watch that is lighter weight than some may be. If you ski or hike in the winter and need to wear gloves, you will want a watch that features large buttons that are easy to push even with gloves on. Ease of Use – Finding a watch with tons of great features does no good if using those features is a complicated endeavor every time you try to set them up or use them. Look for watches that are not overly complicated to program, use, or navigate through. Water Resistance – Even if you are not engaging in water sports, having a water resistant hiking watch is important. If you get caught out in the rain or water gets splashed onto the watch you don’t want it to get ruined. Many of the hiking/sport watches have a lot of weather features that they offer. We have outlined many of these common weather features below. Barometer – This feature is a popular one and warns wearers about many different weather related situations including approaching showers to very serious snowstorms. It measures the rise and fall of atmospheric pressure. It is a great feature to have to predict weather changes to the user that is familiar with the signs. Some models come with alerts that will sound when pressure changes. Altimeter – This feature measures changes in the barometric pressure which drops as the wearer climbs higher and higher. Some wearers pair this with a GPS to gauge altitude as well. Hikers, mountaineers, skiers and anyone that goes up or down hills and mountains will appreciate the information they can get from an altimeter. Make sure that when you are looking at sport watches for altimeter capabilities that you look at reviews to see what customers are saying about accuracy. You may need to re-calibrate the watch often as weather changes affect the baseline barometric pressure. Digital Compass – If you are biking, hiking or camping in the backcountry, you want to have a reliable compass easily accessible. Digital watch compasses are excellent to have as a backup to a hand held compass. Make sure to have an analog compass handy as well because digital compasses require calibration for accuracy and the batteries must be charged constantly for them to work accurately. Route Maps – If you are going to be hiking off trails, look for watches that have mapping functions, GPOS capabilities and the ability to help you find your way should you get lost. Heart Rate Monitors – If you are running, hiking or biking it may be important for you to keep track of your heart rate. Many watches have the ability to track this information. There are two kinds of heart rate monitors that a watch usually offers: the chest strap and the finger sensor. If you want pinpoint accuracy you will want to opt for the chest strap sensor but they tend to cost more. Calorie Burning Monitor – Many watches that have heart rate monitors will have other features such as calorie burning monitors. This feature monitors the effectiveness of the activities you are engaged in. Normally, the calorie burning feature will record how long you have exercised and will compare that to your personal stats including age, height, and weight and will come up with calculations that are specifically for the wearer. Backlight Function – Having a good backlit display means you will be able to see the time and other functions even in low light or dark conditions. Many watches have backlit displays so seeing them, no matter what the lighting is, is easy. Alarms – The alarm functions are good when you want to keep track of appointments or other important situations that you want to remind yourself of. There are anywhere from 1-10 or more alarm functions available, depending on the watch. Calendar Function – A calendar function is always a plus when you want to keep up with the date. Some watches even have a workable calendar that you can schedule appointments on, etc. In addition to the Calendar function, most watches have a day/date function as well that always shows what day it is and what the date is. Buckle or Snap Clasp – Buckle and snap clasp watches tend to be the sturdiest and most comfortable to wear. They are must less likely to break and fall off no matter what the activity is that you are doing. 12/24 Time Choices – There are two types of times that watches offer time in, either military time or standard time. Users can choose which one they prefer to use. Battery Power Indicator – Most watches have an indicator that will let the wearer know when the battery is low. This is useful so you are never caught with a dead watch battery when you need it. When it comes to choosing the right hiking watch, it helps to understand the different features that are available for the outdoor enthusiast. The information in this buyer’s guide is designed to help the consumer decide what features are important to them and what type of watch they want to purchase. With the right information at your fingertips, choosing a watch that will provide all the features you need and plan on using becomes much easier.